Food, Wine, and Miles: 300,000 Starwood Points Up For Grabs! 300,000 Starwood Points Up For Grabs! UPDATE 8/8 - I just added the giveaways from Loyalty Traveler, Johnny Jet, Go Green Travel Green, and Ordinary Traveler. That brings us to 10 in total, and over 500,000 Starwood Points up for grabs! Good luck! 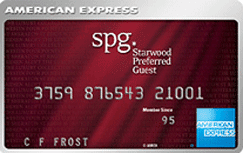 To help promote the newly-improved sign-up offer for the Starwood Amex, Starwood / American Express are partnering with a number of blogs to give away a LOT of Starwood points. (Ok technically I rounded up - it's only 295,000) Up to over 500,000 now with the latest additions! There are reportedly 10 blogs running giveaways, but these are all the ones I've been able to track down so far. Make sure to bookmark this page for an easy access point to each of them, as many allow you to enter on a daily basis. I'll also be updating this post as I come across new giveaways, so check back often to make sure you're not missing out on any! #1 - Many of these contests have a LOT of entries already, so the odds of winning are pretty slim - but apart from The Points Guy's contest, entering requires very little effort. #2 - Entry is limited to US residents, and American Express is mandating that all winners fill out a W9 - which means that the points are likely going to be considered taxable. From reading the info provided in the blogs, it looks like they're assigning a value of 2.5 cents / Starwood point (which is a fair valuation, by the way). This means that winning one of the big ones (like a 50,000) is going to increase your tax burden by $1,250, and therefore leave you owing ~$400-$500 in taxes, depending on your income bracket. $500 is a steal for 50,000 Starwood points, but it's also not nearly as good a deal as $0 for 50,000 Starwood points! The St. Regis Princeville in Hawaii - my favorite Starwood property! If you liked this post, why not sign up to receive free updates via your favorite RSS Reader, or get a daily summary via email - then you'll never miss out on the latest Starwood promotions!